Quiet and comfortable with excellent adjustability! 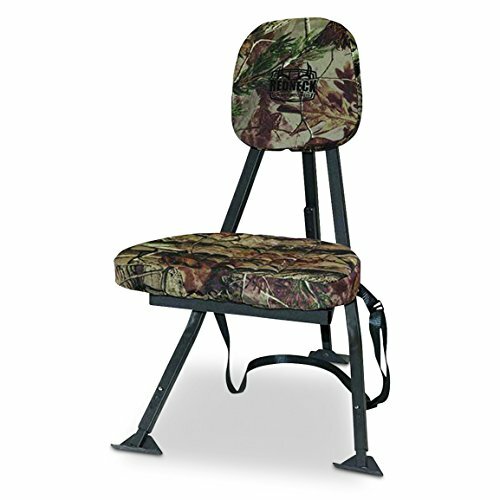 Whether you're hunting in a ground blind or the open field, this Redneck Blinds Portable Hunting Chair is the perfect choice for all-day hunting comfort. The high-density foam seat is incredibly comfortable and quietly swivels 180 deg. Uneven terrain? No problem, thanks to the 3 height-adjustable legs and self-leveling feet. Durable steel frame with powder-coating; High-density foam padding and backrest for maximum comfort; 180 deg silent swivel seat; 3 independent height-adjustable legs for use on uneven ground; Self-leveling feet; Collapses in seconds for easy carry; Removable and washable seat cover; LQS technology (light, quiet, strong); Construction: Steel; Weight Capacity: 350 lbs. ; Seat Height: 17" - 18.5"; Weight: 16 lbs. ; Mfg. Number: RD-FLDDLCH. If you have any questions about this product by REDNEK, contact us by completing and submitting the form below. If you are looking for a specif part number, please include it with your message.